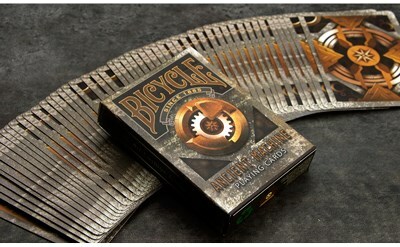 The Ancient Machine deck by Collectable Playing Cards is a unique concept! One for the ages! has the makings of a futuristic, yet olden day design. You will get lost in intricate lines and shapes in the court cards along with the pips. Printed by the United States Playing Card Company. 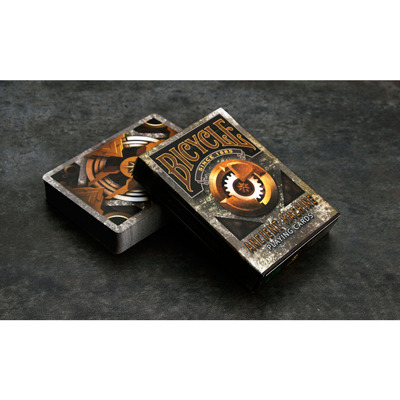 A limited run of not more than 4000 decks. Each deck will be numbered from 1 to 4000. 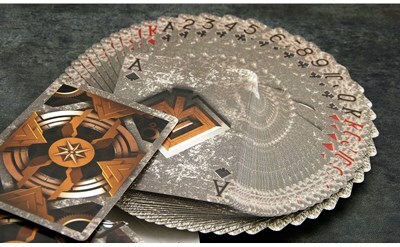 The back card is a symbol of the deck. It's as if it were a flag for the future of warfare. Again, very solid and strong dark golds and silvers. Each court card comes uniquely designed with robotic-like shapes. The gadgets and weapons are upgraded from the original Bicycle style. The warriors seem a bit more prepared to stave off any unwanted guest. Another cool feature are the pips that are displayed directly in the center of the card. The pip outlines are something that has never before been seen on a deck of cards. They have a very rock ?solid 3D design that catches the eye rather quickly. 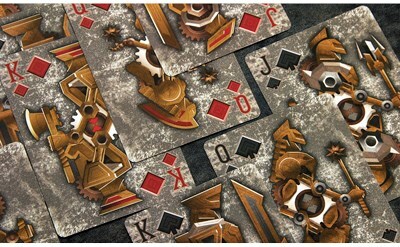 And the colors are very stoic and firm which plays well with the concept of the deck.